Hoping to reverse his crushing defeat at Fort Donelson, Confederate General Albert Sidney Johnston launched a surprise attack at Shiloh on an unwary Ulysses S. Grant. By the end of the winter campaign of 1861-1862, Union Maj. Gen. Ulysses S. Grant had shattered the Confederate defenses in northwest Tennessee with a combined land and water attack on Forts Henry and Donelson, forcing General Albert Sidney Johnston to abandon his bastion at Nashville and retreat southward. Johnston eventually halted the retreat and began to concentrate his forces at Corinth, Miss., a key railroad junction just south of the Mississippi-Tennessee border. From there he would be able to protect the Memphis & Charleston Railroad while plotting his next countermove. At Corinth, Johnston reinforced his army with 10,000 troops under Maj. Gen. Braxton Bragg, coming up from western Florida, and 5,000 more from New Orleans under the command of Brig. Gen. Daniel Ruggles, swelling his army to some 44,000 men. Meanwhile, President Jefferson Davis sent General Pierre G.T. Beauregard west to assist Johnston as his second-in-command. The Confederate withdrawal caught the Federals by surprise, and it took some time to initiate a new offensive. Army politics reared its ugly head after the victories at Forts Henry and Donelson, and the victor of those battles—Ulysses S. Grant—was supplanted by Maj. Gen. Henry Halleck, commander of the newly formed Department of the Mississippi. To make matters worse, Halleck gave Grant’s old command, the Army of the Tennessee, to Maj. Gen. Charles F. Smith, who had no experience whatsoever in directing such a large body of men. Nevertheless, in mid-March Smith sent Brig. Gen. William T. Sherman scouting down the Tennessee River to locate and exploit any weakness in the Southern defenses. Sherman traveled down the Tennessee to northern Alabama and attempted to cut the Memphis-Charleston Railroad. Failing to do so, he retreated upriver and selected Pittsburg Landing, near Savannah, Tenn., as the place to launch the next phase of the Federal offensive. Reinforcing Sherman’s advance force, Smith camped on the west bank of the Tennessee River to await the arrival of Maj. Gen. Carlos Buell, who was leading the Army of the Ohio south from Nashville. The plan was to use the combined strength of both armies to attack the gathering Southern forces at Corinth and seize the railroad there, thus breaking a crucial link between the lower Mississippi Valley and the flourishing cities on the Confederacy’s east coast. Smith’s divisions camped in a thickly wooded area that was the shape of an irregular wedge, with each side of the wedge being three to four miles long. Snake Creek and Owl Creek made up the north and west legs, while the east side was bounded by the Tennessee River. The southeast side was formed by Lick Creek and its branch, Locust Grove Creek; the Shiloh Branch of Owl Creek bordered the southwest side. No entrenchments were constructed due to a lack of engineering expertise in the army and the somewhat casual attitude fostered by the general staff that the Confederates lacked the ability or desire to become the aggressor. While the Union Army lounged about awaiting the arrival of Buell’s army, Beauregard, in his role as Johnston’s chief of staff, began assembling one of the largest military forces west of the Appalachians. He divided the army into three corps: Maj. Gen. Leonidas Polk commanded the I Corps, Bragg commanded the II Corps, and Maj. Gen. William Hardee commanded the III Corps. Major General John C. Breckinridge took charge of the reserve corps. By April 2, Johnston had a combined strength of 44,700 men, only slightly less than the Army of Tennessee’s 48,000. Johnston feared that the united Federal armies would move against him soon, and on April 2 he decided to launch a preemptive attack against the Union position at Pittsburg Landing. Johnston planned to execute a turning movement with his army to get around the Federal left and drive toward the landing, thereby forcing the Federals to retreat from the river into the swamps of Owl Creek, which flowed just north of Shiloh Church, a Methodist meeting place three miles west of Pittsburg Landing. Orders were issued on the 3rd, and the Army of the Mississippi began its movement toward the Federal camp. However, the roads from Corinth to Shiloh were few in number and poor in quality, and the land was covered in heavy woods and frequently cut by ravines and swamps. Even though Johnston’s plan called for his men to be in position to launch their attack on April 4, it took them three days to cover a grand total of 20 miles. The combination of unfamiliar terrain, rainy weather, an inexperienced makeshift army, and a weak command structure contributed to a sputtering start and a critical delay. Not until the 6th was the Army of the Mississippi finally in position to launch its attack. Smith, who had badly injured his leg when he slipped getting into a skiff at Savannah—he would die of an infection a few weeks later—had arranged his forces across the southern base of the wedge between Owl and Lick creeks. On the right flank, near Owl Creek and the Hamburg-Purdy Road at Shiloh Church, was Sherman’s 5th Division.To Sherman’s left and in an extreme forward position was Brig. Gen. Benjamin Prentiss’s 6th Division. A mile and a half to the rear was Maj. Gen. John McClernand’s 1st Division. To McClernand’s left was Brig. Gen. William Wallace’s 2nd Division. Brig. Gen. Stephen Hurlbut’s 4th Division, aided by Colonel David Stuart’s and Brig. Gen. John McArthur’s detached brigades, held the extreme left, anchored on the banks of Lick Creek. Major General Lew Wallace’s 3rd Division was positioned across a bridge north of Snake Creek, connected to the rest of the Union Army by the Hamburg-Savannah Road. Grant, now restored to overall command of the Army of the Tennessee after the brief misunderstanding with Halleck, established his headquarters a few miles away at Savannah. Reviewing Smith’s troop placement, he saw no need to make any changes or to prepare a new line of defense. The Union front remained vulnerable to attack. Although confident that Johnston’s army would not dare attack his position, Grant nevertheless ordered a reconnaissance toward Corinth on April 3. The men had not traveled more than three miles from camp before they ran into a company of Confederate cavalry. No shots were exchanged and both sides retired unmolested, but an alarmed Prentiss kept sending out scouting parties to reconnoiter the area in front of his position. When they encountered new Confederate resistance on the 5th, they immediately reported the encounter. Grant, however, treated this as an isolated event, and no further defensive action was undertaken. Major General William Nelson arrived in Savannah with the advance division of Buell’s army of the Ohio on April 5 and reported immediately to Grant. New orders were cut to move Nelson’s 4th Division to Pittsburg Landing as soon as adequate transportation became available. Five Union divisions now were camped on a rugged plateau, while Nelson’s wearied division rested just across the river. The remainder of Buell’s army was still bivouacked a full 30 miles up the road from Savannah. 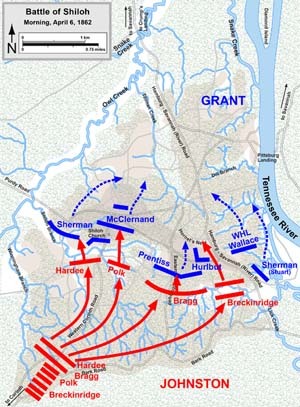 Beauregard, believing that the element of surprise had been lost due to the previous skirmishing between pickets, recommended calling off the attack. Johnston disagreed, reasoning that a quick, decisive strike would destroy Grant’s army. Silently, in a heavy rainstorm, the Confederates moved to within four miles of the Federal camp. Halting at the intersection of the Hamburg-Purdy and Corinth-Pittsburg Roads on the stormswept night, the Confederates hunkered down to wait for dawn. Long before first light, Johnston’s army was up and fed, their cumbersome blankets and knapsacks stripped off as they prepared to move out. As the sun began to peep through the young foliage of the forest, 44,000 Confederate soldiers who had never seen combat, led by officers who had never attempted to manage a force of this magnitude, moved through dense woods intercut with deep ravines. Their advance, over pathways that resembled Indian trails more than roads, made it difficult for them to maintain a solid, linear formation. Communication between the advancing divisions was an equally daunting task. Johnston personally led the brigades from the front, while Beauregard remained in the rear directing reinforcements and supplies. While Johnston was still concentrating his forces, a small Federal reconnaissance force passed through its own picket lines and moved forward. Entering the forest, the men marched in the direction of the Corinth road. The going was difficult because of the thick canopy and uncultivated brush. Upon breaking clear of the forest, the Union force stumbled directly into the middle of Hardee’s corps. More startled that anything else, both sides exchanged harmless musket fire before the Federals retreated to their camp. While the main Union force went about its daily routine, blithely unaware of the most recent skirmishing, the gray-bloused Confederates made their final preparations. The plan was to attack along the broad front of the Federal line, which extended from Owl Creek to Lick Creek, a distance of three miles. Stacked into three distinct lines of battle, Hardee commanded the initial strike force, supported by Bragg and Polk in a second wave. Breckinridge would bring up the rear. Each battle line was separated from the other by a distance 500 to 800 yards. The slashing attack began with a deep roar of heavy cannon, followed by the sharper rattling of musketry. Storming forward, the Confederate infantry attacked on all fronts as squadrons of cavalry charged both wings. With the force of a spring thunderstorm, Hardee’s men fell upon the Federals. Pausing to deliver a second volley of fire, the surging Confederate masses charged Sherman’s raw regiments. The first to bear the shock of the oncoming Confederates, Colonel Jesse Hildebrand’s brigade quickly retreated in panic before the onslaught. Soon the brigades of Colonels Ralph Buckland and John A. McDowell came under fire as well and quickly sought shelter as the two sides began to blaze away at will. Tags albert sidney johnston, Army of the Mississippi, Army of the Ohio, Army of the Tennessee, Battle of Shiloh, Confederacy, General Braxton Bragg, General Lew Wallace, Jefferson Davis, Leonidas polk, New Orleans, Ulysses S. Grant, Union Army.